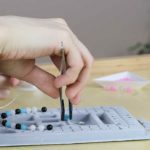 After spending hours on a bead stringing project, have you ever had the “pleasure” of chasing after spilled beads? Your precious time goes to waste all because the beads were not correctly secured. Bead Stoppers are a simple yet genius tool used to prevent accidental bead spills. 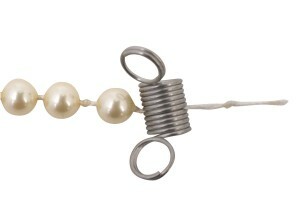 Bead Stoppers will securely hold your beads in place, keeping your beads on the string where they belong. 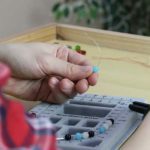 With Bead Stoppers you can work on several designs at a time, travel with your work, let it sit for a long period of time, all without the worry of any beads falling off. 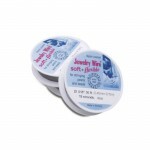 They can be used on the majority of stringing materials such as bead cord, jewelry wire, and leather cord. No need for sticky tape or a destructive alligator clip, with the smooth coiled design of a Bead Stopper you’ll never have to worry about your bead cord getting frayed. Bead Stoppers are extremely easy to use and will work on both basic single strand and intricate multiple strand designs. Bead Stoppers are without a doubt a tool you’ll love using. Which Size Bead Stopper Should I Use, Large or Small? For thinner stringing material such as nylon or silk bead cord or for smaller beads, we suggest the small size bead stoppers. The small size measures a ¼” in width. For thicker stringing material like leather cord or jewelry wire or for larger size beads we recommend using the large size bead stoppers. 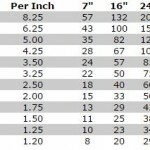 The large size measures a ½” in width. When you are ready to let your work sit, grab a bead stopper. Squeeze the trigger loop ends so the coil gaps wide enough to fit around your stringing material. Place the bead stopper on your stringing material, right in front of the last bead(s) you strung. Then release the trigger. Gently tug on the Bead Stopper to ensure it’s securely in place. You’re all set to go about your business without the worry of any beads falling off your design!